Aam Panna, The Green Cooler!! 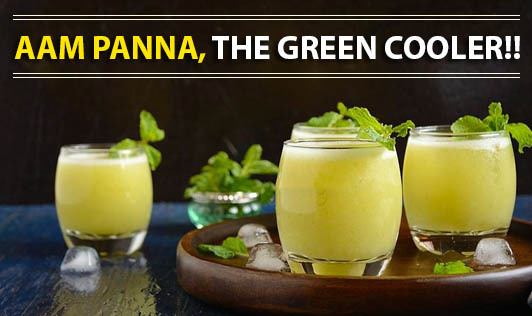 While the heat is catching up with all of us, ‘Aam Panna' can be an excellent summer chiller! Apart from being a refreshing drink, it has various health benefits. • It is an effective remedy for heat exhaustion and heat stroke. • This drink, being popular in northern India, is known to treat gastrointestinal disturbances and certain blood disorders. • It is considered as a tonic as it builds resistance against tuberculosis, cholera, dysentery and anaemia. Here is a quick recipe for this delicious drink. • Roasted black pepper powder: As per taste. • Pressure cook the mangoes till soft. Allow it cool down. • Remove the pulp from the skin and seed. Grind it to a fine paste. • In a bowl, add ¾ cup of water, mango pulp and jaggery as per your taste and bring it to boil. • To prepare a glass of ‘Aam Panna', add 4tbsps of this mixture. Add ¼ teaspoon of cumin powder, black pepper and black salt. Add 1 ¼ cup of chilled water and mix well. • Pour into a glass with crushed ice and serve. Note: This prepared mixture can be stored in refrigerator for 3-4 days and for about a week when stored in deep freezer.